Ulysses S. Grant, Jr, (1852-1929) was an American attorney and entrepreneur, the second son of President Ulysses S. Grant. After moving to San Diego in 1893 Grant set up a law practice, then gave it up to invest in real estate. He purchased property throughout San Diego. In 1895, he bought the Horton House hotel. In 1905 he razed the old hotel and built a new one in 1910 which he named the U.S. Grant Hotel after his father. San Diego voters helped finance $700,000 for the $1.5 million needed to construct the hotel after Grant lacked the funds to do so. 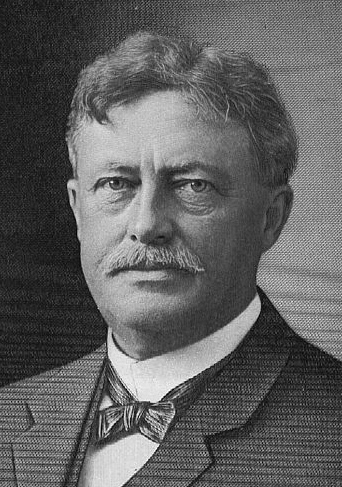 In 1909 Grant was elected the first president of the Panama-California Exposition and was re-elected president in 1911. During a dispute with the Park Board, chiefly over Frank P. Allen, Jr’s salary of $20,000/year, members of the Exposition Board threatened to resign, as did members of the Park Board. The dispute was resolved and Allen remained. Groundbreaking ceremonies were held in Balboa Park on July 19 1911. Joseph Sefton, Jr., loosened the earth with a silver pick. He then handed a silver spade to Mr. Barrett and the latter turned the first sod. The spade was then passed in succession to Mr. Grant, Acting Mayor Wood, Mr. Gates, President Charles Moore of the Panama-Pacific Exposition, John D. Spreckels, Governor Richard E. Sloan of Arizona, Will H. Parry, representing the governor of Washington, and to several prominent San Diego citizens. Each turned a spadeful of earth, the implement being finally passed back to Mr. Sefton, who turned the last sod. …adapted from Wikipedia and Balboa Park and the 1915 Exposition by Richard W. Amero.